In a nutshell, they discovered 19 genes that were often mutated in these cancers. So let me tell you a little about the most intriguing mutations. One of the genes, called VHL, normally acts like the brakes on your car and helps suppress cell growth when oxygen is limited. But when VHL is inactivated by mutation, the brakes are released, and the cells are able to keep growing even when there is limited blood supply (as is often the case for an expanding tumor). Another group of mutated genes controls the structure of the DNA and proteins that make up the chromosome—the so-called “epigenome.” Regulating this complex chromosomal architecture is essential for turning genes on and off at the correct times. When the epigenome loses its fine tuning, these switches can malfunction, leading to abnormal growth of cells. Finally, mutations were identified in specific oncogenes in the growth-promoting pathway called PI3K/Akt. These mutations create a situation like a stuck accelerator in your car—the cells just keep growing when they should have stopped. The analysis also revealed that the tumor cells shift almost exclusively to a high output, but metabolically wasteful, sugar-based power generator, called glycolysis. Glycolysis helps the tumor cells produce lots of energy, but in a way that deprives the body of its normal efficiency. Normal cells act like a highly engineered hybrid vehicle. The cancer cells are more like a gas-guzzling SUV. If we better understand how cells become more aggressive—what genetic switches and proteins they use to push growth—we can develop more specific targets for drug therapy. The more precise our therapy, the less collateral damage will be done to a patient’s healthy tissue. About 65,000 people in this country will be diagnosed with ccRCC in 2013, and more than 13,000 people will die. If the disease is caught in the early stage, more than half can be treated successfully with current therapies. Given this cancer’s notorious resistance to chemotherapy in its later stages, TCGA’s findings offer a wealth of new targets that I expect will lead to some novel drugs—and perhaps even therapies for other cancers, too. 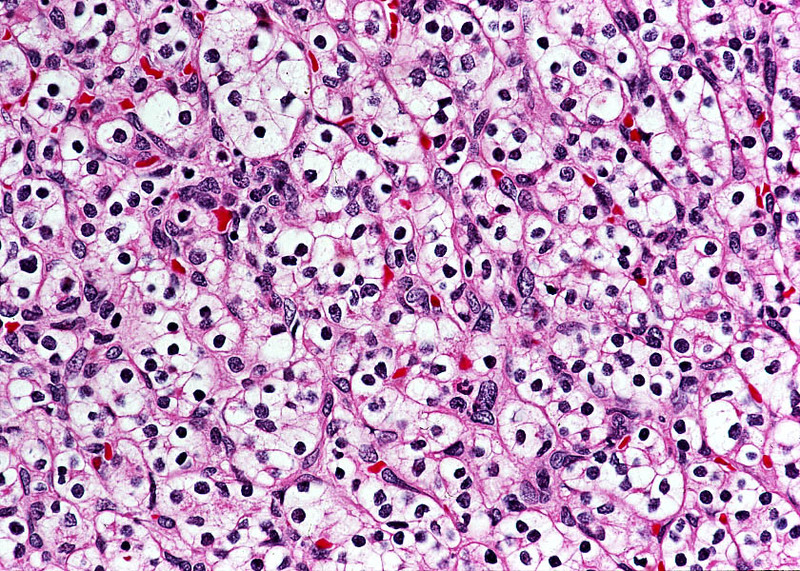 Comprehensive molecular characterization of clear cell renal cell carcinoma. The Cancer Genome Atlas Research Network. Nature. 2013 Jun 23. Yeah, it is necessary to know that cancer is a slow growing disease at first. So healthy lifestyle behaviors for cancer risk reduction include a healthy diet, weight management, regular exercise, reduction in alcohol consumption and smoking cessation. I understand the risk using mobile phones but do not understand how Ipad puts one into risk of Cancer. My husband just got diagnosed with renal cell carcinoma (RCC) and I need help with his situation. Thank you so much for directions to the website. We really need help! Thank you very much!